Each school year I consider a co-op to enhance our learning experience. And nearly every year I decide against joining one. My husband laughs at me because he knows I’ll ultimately say no to a co-op even though I research, talk to other families, and explore the class options. He was right again this year as I chose to bypass the local co-op. Scheduling – It never fails that the classes and co-op schedule are a problem. Either the two classes that my child is interested in taking are at the same time, or the classes are at a time of day that is not convenient for me. In one co-op, the classes we wanted to take were at 9 am and then at 11 am. This would mean that I would have an hour in the middle of the morning to fill – I wouldn’t have time to run home so I would have to put my children in additional classes. Preparation – Many of the co-ops for younger grades are parent led which means that I would have to teach at least one class and co-teach another class. Currently, I feel pretty maxed-out preparing for my own little munchkins and their school time. I can’t imagine preparing for a small group of students, planning activities and crafts, purchasing materials, and creating a schedule. Right now I just don’t think I’m up for that challenge. Expense – Some co-ops bring in outside teachers for most of the classes. This is great because it means that moms don’t have to teach as many classes. However, these co-ops can be very pricey-especially if your children are in elementary. When I investigated a local co-op over the summer I saw that kindergarten – 2nd grade art would be $150 per child and the Spanish class for K would be $100 per child. I understand that outside teachers need to be paid for their time and materials but when you have 5 children to put in various classes that becomes expensive very quickly. It’s also not worth it for me to pay that kind of money but still be required to stay on campus. I’m also fairly certain that I can create a fun art class for my K student and not spend anywhere near $150 per semester. Organization – With co-ops you sometimes get what you pay for in terms of structure and organization. Some can be extremely disorganized and others lack a set of expectations which causes confusion later in the year. When I was investigating a new co-op this past year, I saw the rules and expectations change multiple times over the summer without notice. The structure and class schedule was constantly changing and it was stressful to try to keep up with the changes and know what to expect. Some co-ops lack a set of written rules to deal with misconduct and other issues while other co-ops go to the extreme and feel more like signing up for a prison sentence. I had one co-op that require parental interviews and the leaders asked us very pointed questions about your child’s discipline and behavior problems right in front of our child. So I worry that lack of organization or unclear expectations will cause us to have a stressful co-op experience. Tension – Usually co-ops have a group of members that form the leadership board and they often don’t all get along with each family having a different vision for the co-op. Because the co-op was not started with clear expectations and often lacks organization, this can lead to tension between the various members. The co-op I planned to join this past year had a major communication breakdown as one leader unilaterally made multiple last minute changes and cancelled some classes. There was a huge backlash on the group’s public forum and many of the moms got downright ugly with each other as they aired their disagreements in public. I was thankful I saw that glimpse into the hearts of the leaders and teachers before I had fully committed. I think I saved myself from an explosive situation. Lack of Balance – Some co-ops are more social in nature and include PE-style classes or art classes. These co-ops focus on extracurricular activities that don’t affect the core subjects taught at home. Other co-ops are more academic in nature and do dictate what curriculum is used at home because most of the core subjects are taught at the co-ops. I probably prefer a co-op that is more social and extracurricular based while my kids are in elementary. Unfortunately, it is challenging to find room in the budget for classes that are simply extras while still being able to participate in other outside activities. And as for an academic co-op, my kids are so young that I don’t want us to be stressed in an environment that focuses solely on academics and adds more work to our schedule. Freedom – Ultimately, I don’t enjoy how a co-op limits our freedom. We enjoy having get-togethers with friends, visiting with out-of-town family, taking a family day, or making time for field trips. If we were in a co-op that would take up an entire school day for us which would limit the amount of time that we could spend on other pursuits. It would also mean that we would have to more carefully plan trips and family time so that we did not often miss out on co-op class time. I don’t want a co-op to be the driving force behind our schedule. Time – The main reason I keep deciding against a co-op year after year is because of the time involved. I would be teaching or helping in some capacity every week which would mean that I would have to do some prep work. We would lose an entire day as we participated in a co-op. I usually like to have a 4-day school week with one extra day to catch up on any subject that is behind, plan a field trip, have a play date with friends, go to a park, or simply have a day to read and relax. If we were in a co-op then we wouldn’t have our “extra” day each week to pursue our own interests and our schedule would feel more limited. Instead of doing a co-op, we put Curly in an online class for her to have the chance to learn with other students and have outside accountability in one subject. So far, that has been a perfect compromise for us. We have only one child taking an outside class that she does online from home, yet we still have our typical 4-day school week with lots of time for field trips, play, or friends. But you know what I’ll be doing next year? Evaluating if a co-op is right for us. I do it every single summer. So far the answer has always been “No.” But someday as my kids are older and I’d like some outside accountability or reinforcement in some subjects, I may find that a co-op is a good fit for us. For now, you’ll find us at the park with friends or making our own lego creations after we have a picnic in our backyard. Thank you for writing this! I also have not joined a co-op for all these reasons, but sometimes I feel guilty, like I’m depriving my kids. The minute you start homeschooling, it seems people assume you will do a co-op. Glad I’m not the only one not doing it! Yes. Whenever I tell people that I homeschool their next question is ALWAYS, “are you in a co-op?” No, No I’m not. And we do just fine without one for right now. 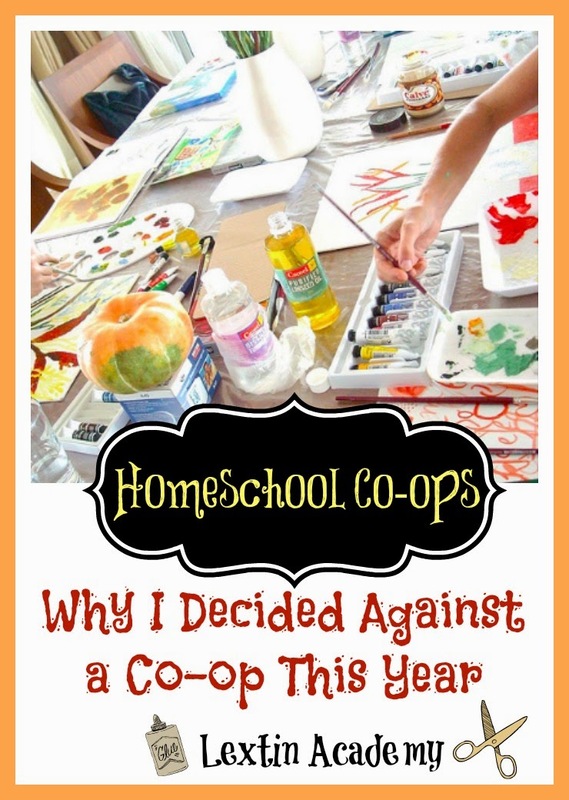 Homeschooling can be done without a co-op! But I sometimes feel guilty too. I actually have been having a hard time finding other homeschoolers in my town who aren’t members of a co-op, tutorial, or some other outside-the-home type of education. Which is perfectly fine for them, but leaves me wondering if I’m missing something important by not choosing any of those things for my family. I know why we don’t, and I’m very confident and comfortable with our reasons, but I still wonder from time to time as I keep meeting families that do use those particular resources. Yes, I often feel the same way. I wonder if I’m depriving my kids of important experiences by skipping co-ops. That’s not to say we won’t ever try a co-op, but for now I know it’s just not right for us. Our schedule is far too full right now! It does make homeschooling feel slightly lonely though. I sometimes feel like a bit of an outsider since we aren’t a part of one of the co-ops in my area. It’s hard to connect with other homeschoolers when you aren’t part of their group. This is so helpful. I’ve been researching co-ops for the next school year and it is exhausting. Some are so laid back it makes me feel like I’d be paying membership dues for playdates….others so rigid I think I’d be constantly stressed about meeting dates and schedules. I have four littles right now, first grade and kindergarten and then preschool, as well as a babe with health issues requiring lots of extra care. I worry that I’m somehow failing by missing out on the perks of a co-op, but the added stress is just that: stress! (Also, the cost is a huge deterrent for me… obviously people need paid for their time, and supplies cost money…but I looked at one co-op that had an annual family membership fee, individual class fees, supply fees for certain classes in addition to the class fees, and then a facilities fee not included in the other costs…. Meanwhile I’m trying to squeeze all our curriculum for our school year into a tight budget with little room to spare as it is!) I think for now we’ll skip the co-op and utilize other resources for extracurricular needs.